Angel Whisper is full of assorted translucent white glitter in a clear base with lots of shimmer. Shown is 1 coat over 2 coats of Zoya Liberty with a top coat of HK Girl Top Coat. A Whiter Shade of Maybe has multiple sizes and shapes of opaque white glitter in a translucent shimmering base. The microglitter mix gives it a grey appearance in the bottle, but grey clears when applied. I started with 2 coats of China Glaze Spontaneous and added 1 coat of A Whiter Shade of Maybe with a top coat of Seche Vite. Beside Herself has opaque white glitters accented with black and opaque brights in a clear base with pink, aqua and blue multi-shimmer. All nails are 2 coats over 2 coats of Illamasqua Serenity with a top coat of Seche Vite. Mixed Feelings is the latest member of The Glittering Crowd lineage. 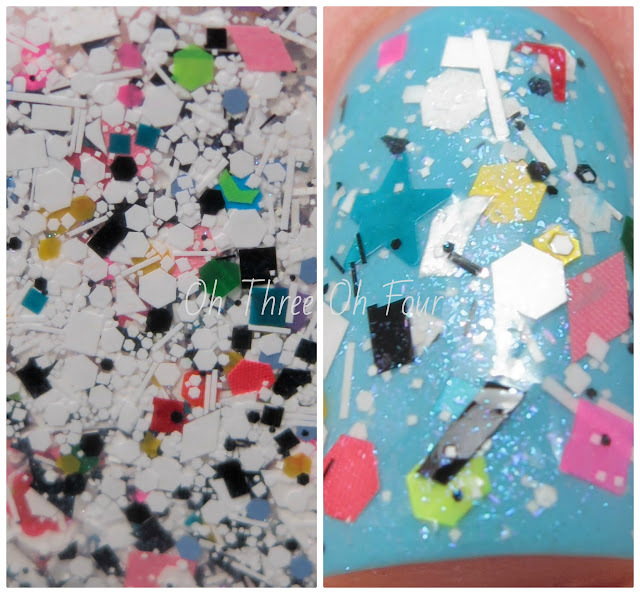 More than 300 assorted glitters with iridescent blue flash overlay and clear base. I used 1 coat over 3 coats Sinful Unicorn and a top coat of Sally Hansen Insta-Dri. Spot On. The latest incarnation of Connect the Dots. 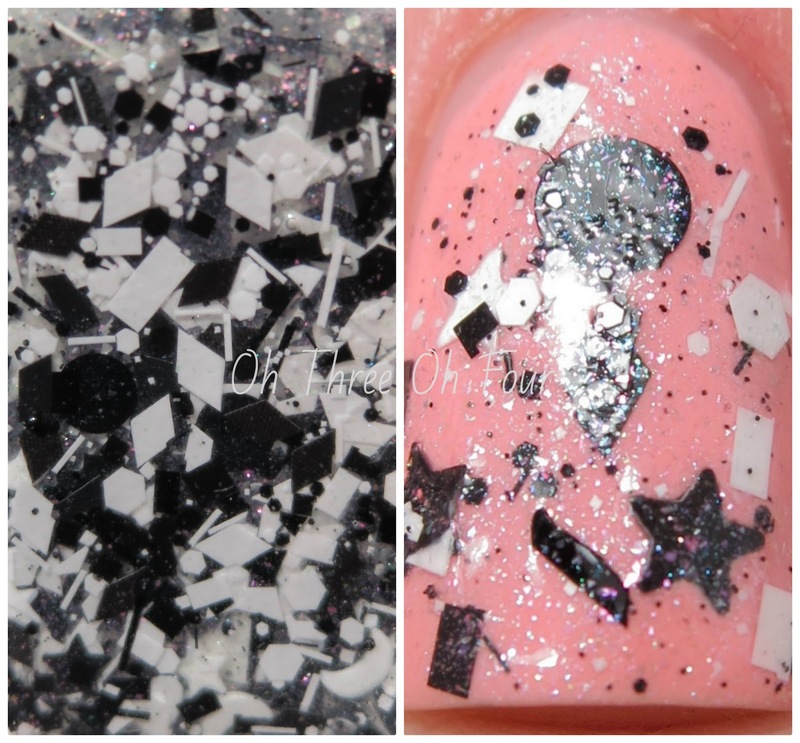 Assorted black and white glitter shapes in an intense multishimmered clear base. This is 1 coat of Spot On. over 2 coats of Sinful Orange Cream and a top coat of Seche Vite. Stay Goodbye has scattered neutral, neon, pastel, holographic and satin glitters in a translucent chocolate malted milk base with complex multi-shimmer. All nails are 2 coats of Sinful Pistache with 1 coat of Stay Goodbye and a top coat of HK Girl Top Coat. yesno stopgo is an edgey mix of black glitters accented with white and intense micro glitters in a clear base. I couldn't make up my mind which combination I liked more, so I included both! 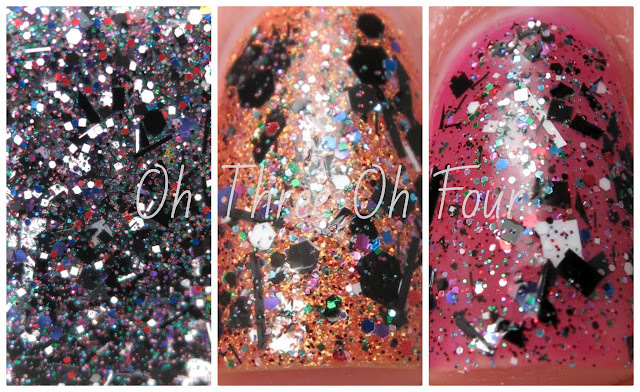 ;)The first photos are 1 coat of yesno stopgo over 2 coats of Zoya Beatrix. The second picture is 1 coat of yesno stopgo over 3 coats Revlon Destiny. Both have a top coat of Seche Vite. 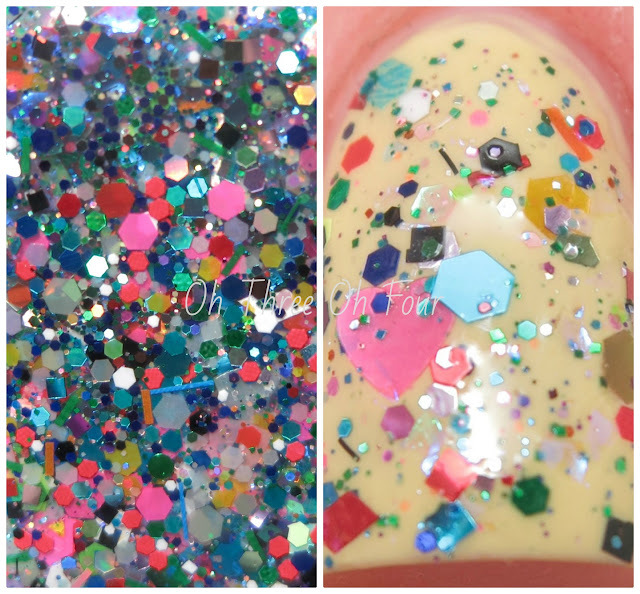 Anyone within the states can purchase Lynnderella polishes through Lynnderella.com. For anyone living in Europe make sure to check out Norway Nails! Follow all the Lynnderella fan pages on Facebook, Twitter, Instagram and Tumblr. Be sure to follow Norway Nails as well on Facebook, Twitter, Pinterest and Instagram. If you are looking for some comparison and other swatches of this collection follow AtlCatsMeow on Facebook and Instagram.